saying it's not a solution to lost markets due to retaliatory tariffs and doesn't come close to covering damages. Several farm groups said they appreciate USDA's announcement on Monday that it will provide $6.1 billion in assistance to farmers hurt by retaliatory tariffs, but others said it isn't enough to offset their impending losses and called for an end to the Trump administration's trade disputes. 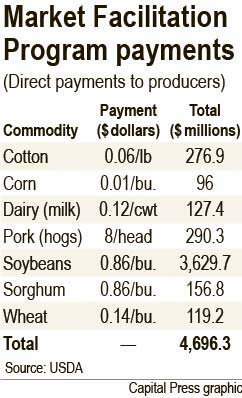 USDA's three-pronged plan includes about $4.7 billion in direct payments to farmers, $1.2 billion in government food purchases and $200 million for trade promotion. The American Farm Bureau Federation said farm income is at a 12-year low, so any assistance is appreciated. "The additional burden of tariffs on the goods we sell to China, Canada, Mexico and the European Union has been more than many farmers can bear. Today's announcement gives us some breathing room, but it will keep many of us going only a few months more," said Zippy Duvall, the Farm Bureau president. The real solution is to take a tough stance at the negotiating table and quickly find resolution with U.S. trading partners, he said. National Farmers Union said the aid package will begin to help many who are suffering the brunt of retaliation, but farmers and ranchers need strong markets and long-term certainty. "This trade war has already caused irreparable, long-term harm to what were strong trade relationships for American family farmers and ranchers," said Rob Larew, NFU senior vice president of public policy and communications. NFU wants the administration to pursue fair trade agreements, transition from an ad hoc emergency aid strategy and work with Congress to develop a legislative solution to low farm prices, he said. The National Association of Wheat Growers said USDA's proposal poorly reflects the reality that all farmers are being harmed by tariffs. "Farm income is down, and rural America is enduring a prolonged economic downturn. This relief package shows that the administration isn't grasping the tough conditions being faced by farmers," Jimmie Musick, NAWG president, said. The long-term solution is to end the trade war, he said. National Pork Producers said the aid package demonstrates Trump's commitment to American farmers and will bring some relief from retaliatory tariffs. "While we're grateful and commend the administration for its action to help us, what pork producers really want is to export more pork -- and that means ending these trade disputes soon," Jim Heimerl, NPPC president, said. American Soybean Association said the payments to farmers will partially offset the impact of China's tariffs on U.S. soybeans and increasing funding for market development is even more crucial, given the need to find new export markets. "While this assistance package will definitely help our farmers get through the bad patch we're currently facing, we must remain focused on market opportunities in the long term," ASA president John Heisdorffer said. The National Corn Growers Association said the aid to farmers won't even begin to address the serious damage done to the corn market because of the administration's actions. "While most members prefer trade over aid, they support relief if it helps some farmers provide assurance to their local bankers and get through another planting season. Unfortunately, this plan provides virtually no relief to corn farmers," said Kevin Skunes, NCGA president. The National Milk Producers Federation said the plan falls far short of addressing the losses dairy producers are experiencing. "Although there may be a second direct-aid package at the end of the year, dairy producers are greatly disappointed that the farm portion ... does not adequately address the harm done to dairy," Jim Mulhern, NMPF president and CEO, said.